There's one thing about living with a runner that I loathe - his laundry. Typically, I try to wash his running clothes the same day he goes running, because if you don't - well, your nose will pay the price. 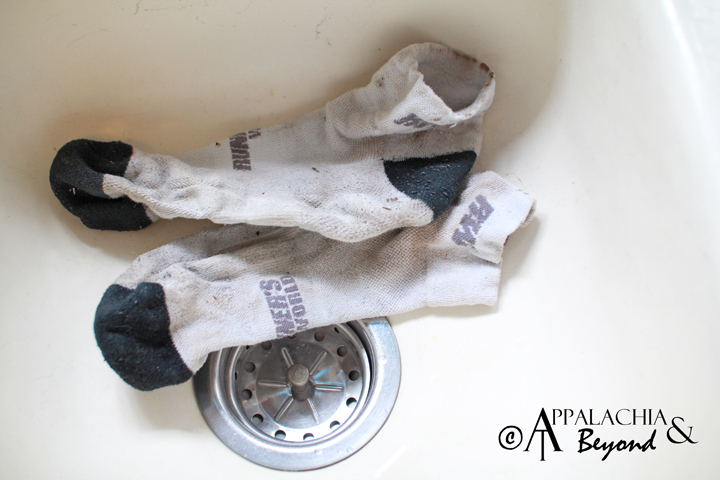 More times than not, he'll come home muddy and sweaty, throw his running shoes in the laundry room, and then shower. 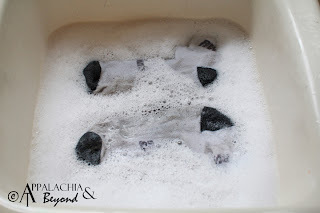 I'll grab up his clothes that he's placed wherever (it's a hunt every time), and either strategically place them in an area where they can air out or wash them immediately. Well, this past week my 6-year-old LG front loader decided it was going to quit spinning. Long story short, laundry piled up... and piled up... and piled up while we waited over a week for the part to get here. At one point, laundry had gotten so out of hand that I took some loads over to my mom's house to wash. That was when I found THE SOCKS. 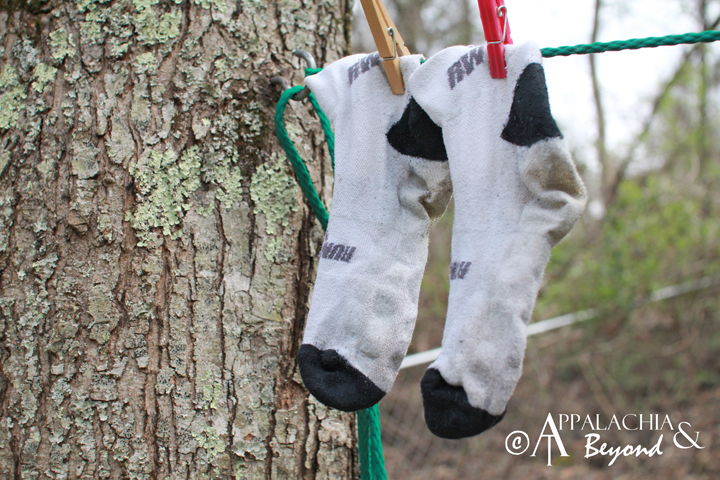 Stuffed down in some damp, muddy Vasque running shoes were a pair of dull white and black Runner's World socks. Someone (I won't name any names) thought it was a good idea to just leave them in those shoes to marinate for a week. Have you ever smelled male cat piss? Add that to male body funk and you've got it. (You're welcome in advance for the lack of smell-o-blog.) I picked them up, and even from a distance they nearly knocked me on my rear. There was NO WAY these puppies were going in with the regular laundry. 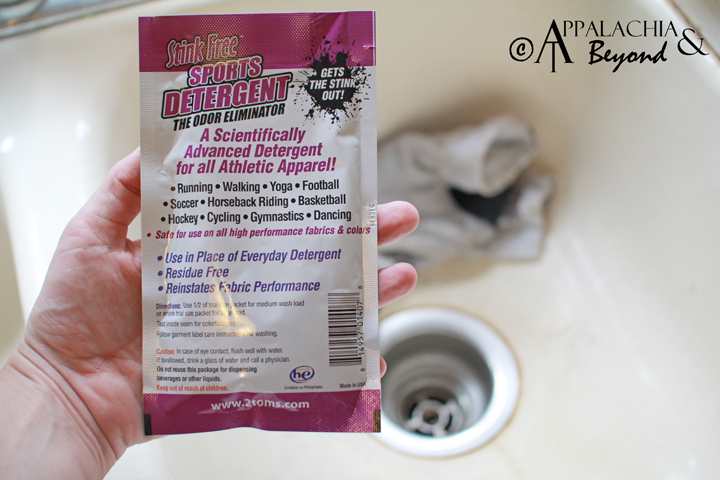 So after remembering that 2Toms had sent an envelope with their Stink Free Sports Detergent for us to review nearly a year ago (sorry 2Toms! 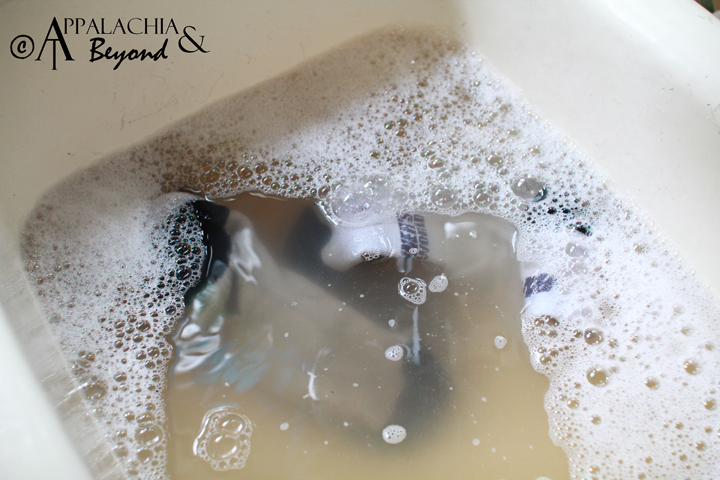 ), I decided I would TRY to hand wash them. Otherwise, they were going in the trash. 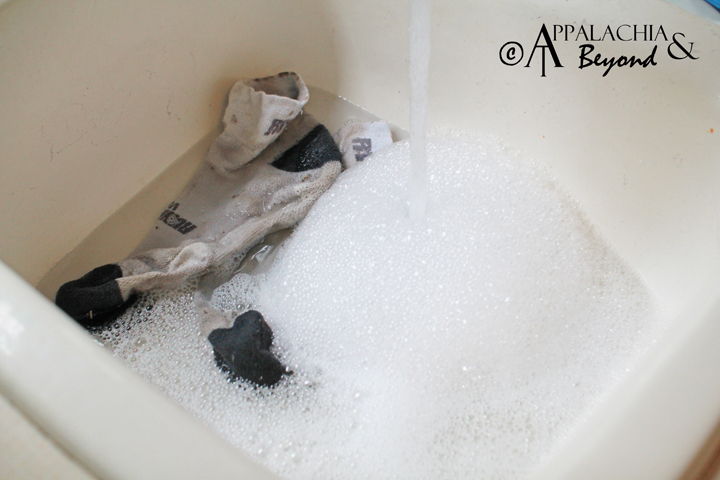 I filled the sink with warm water, the socks, and poured half the package in. I spun them around a little with my hand, and decided they were going to need to soak. For a WHILE. 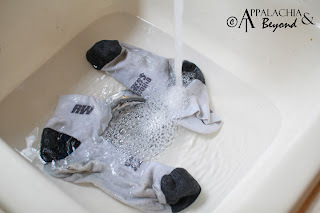 After rinsing, the socks smelled great! No more stink! They're still stained, but whose sport socks aren't? Although I have to say, the 2Toms has a bit of a chemically smell to it. And it's not something I would want to use on a daily basis. We have a sensitive septic system, so I usually use Method's plant-based biodegradable detergent. But people on sewer systems that don't mind their carbon footprint would love this stuff for their stinky stink stinks all the time! "It’s not the sweat that gives you stinky socks. It’s the bacteria on your skin combined with the sweat that causes body odor. And since your clothes touch your skin during exercise or hard work, the sweaty bacteria attaches itself to your clothing, too. Sweaty clothes are a breeding ground for smelly bacteria. Many of today’s high-tech fabrics are designed to wick sweat away from your skin, absorbing moisture and keeping you dry. The problem is these sweat-wicking fabrics lock in the stink, too. Regular laundry detergent is formulated for lightly soiled cotton-based fabrics, and cannot effectively get the odor out of your stinky socks, smelly shoes, sweat-stained shirt, etc. The only thing that can get your smelly clothes fresh is a sports detergent specifically formulated to eliminate the sweat left in the clothing that causes odors." With that in mind.... There will be a second installment of this review. I'm desperate to see how this will work on OUR SHOES!!! Stay tuned! Any sport, exercise or dirty job! Test inside seam for colorfastness. Follow garment label care instructions for washing. Top Loading Machines: Use full cap. Larger loads may require more detergent. Wanna give it a try? 2 Toms Stink-Free Sports Detergent - 2 oz. Wanna buy the larger bottle? 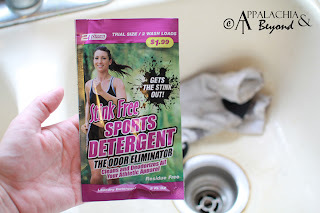 2 Toms Stink-Free Sports Detergent - 30 oz. Happy Trails to all ya'll UNstinky people! You can thank me later. Disclaimer: Tim and Robin received the 2 Toms Stink-Free Sports Detergent Packs from the 2 Toms marketing department for review purposes only. Appalachia & Beyond are in no way affiliated with 2 Toms and are not being compensated by 2 Toms for this review.. The opinions expressed above are Tim's and Robin's independent thoughts and experiences.